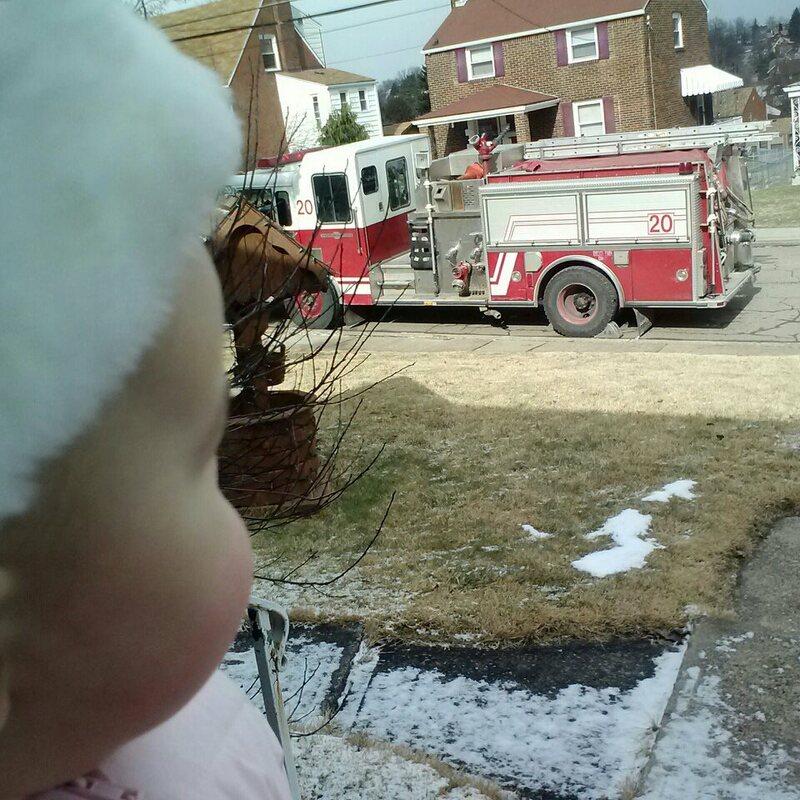 Life in the Pitts: You never know when your greasy self will be sitting outside, talking to a fireman. You never know when your greasy self will be sitting outside, talking to a fireman. I crawled behind the couch, squinting at the carbon monoxide detector. It shrieked in my ear. I hit the reset button, but it kept on beeping- not constantly, about every 5 seconds. "Ok Syndil, what do you think?" "Good idea. Google will know what to do." I opened the kitchen windows as I passed by, and turned the furnace off. Then I opened the front door, and hit the lock button on the screen, to keep it propped open. Syndil shivered as a gust of 20-degree air blew into the room. I braced her on my hip as I leaned in to type. "Ok, google, what should I do?" "Why are you googling this? Call the Fire Department and get out of your house!" Google answered. I called 911, and explained that I wasn't sure if this was an emergency. They said they weren't taking any chances. We bundled up, and headed outside. Syndil in her snow suit, me in my pajamas and Kurt's brown hoodie. Because I'm classy like that. I could hear the sirens long before they pulled up. They made quite a few wrong turns, and I listened as they wound their way through the neighborhood. "Maam, would you like to wait in the engine?" I should have said yes. It would have been a lot of fun. My neighbor ran over to see if we were ok. That was really nice. "Syndil, remind me to bake him cookies." In the end, it was just an old detector. But our stove is "unacceptable", so they are sending someone out from the gas company, to officially demand that we get a new one. "Also, remind me to call the landlord." As they were leaving, one of the men asked if I could come and dust his house, because ours is one of the least dusty homes he has seen. You guys, I haven't dusted since we moved in a year ago. What does that say about the rest of Pittsburgh?? And then they all stopped to admire our porch screen. For about 3 minutes. "It is such a good quality door! Look at this thick glass!" "And see how it holds open like that? It is so well made!" "Let's try to figure out who makes it!" Bemused, I watched them crowd around it, searching for a logo. Moral of the story? Take that shower you've been avoiding. Even if you don't plan on seeing anybody, you never know when your greasy self will be sitting outside in the light of day, talking to a fireman.